This was originally posted on my lifestyle blog, A Northern Girl, for my 2016 gift guide. You should share the pizza love all year long, though! We’re just a few weeks out from Christmas, and in the crunch for wrapping up the holiday shopping lists! If you’re feeling stuck on gift ideas, I’ve put together a week of ideas to help you get inspired. It's no secret that I love pizza - especially if you follow me on Instagram, where I recently started a hashtag to document all the slices I've been taking in. 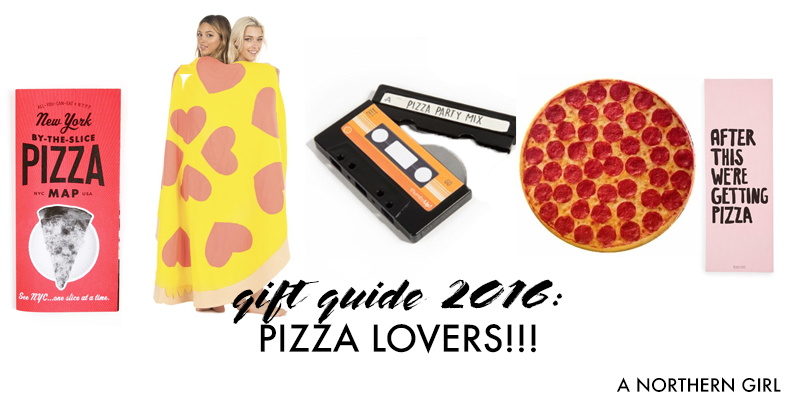 Chances are about 100% that you also have a pizza lover in your life, so here are some gift ideas for the aficionado in you love! Blanket: I'm in love with this, and need it desperately. This giant pizza shaped blanket (with heart-shaped pepperonis!!!) is even on mega-sale, all the way down to $25. The perfect size to cuddle up with on the couch, a pizza box, and a good TV binge. Cassette Tape Pizza Cutter: Perfect for the music and pizza lover (like me,) I saw this little guy in a record store and thought it was so funny! It would look great in a kitchen next to one of my favorite kitchen utensils, drumstick-ended wooden spoons. NY By the Slice Map: I wish I had heard about this company before I went to New York a few weeks ago. This map features 40 of NYC's best pizzerias according to the NY Pizza Project, and I can only hope my dear Anna Maria's made the list - I've been dreaming out those slices every day since I left. Pizza Bikini: Some people might argue that in order to attain the perfect beach body, you might want to lay off the pizza. I wholeheartedly disagree - I think it should be embraced to the point that you wear it to the ocean. Plus, it could probably be a great icebreaker, resulting in a pizza date! Pizza Seat Cushion: Get a cushion to go along with your pizza blanket - though this is built to be a seat cushion for dining room chairs, I bet you could just as easily snuggle up with it in your arms. Pkew Pkew Pkew - Self Titled Album: I started listening to Pkew Pkew Pkew earlier this year when I heard their song "Let's Order A Pizza," which caught my ear and hasn't let go yet. The vinyl doesn't appear to come in a pizza colorway (a real missed opportunity) but both the physical and digital album are great listening for your next pizza party. Honestly, I could go on and on with pizza gift suggestions, but I'll refrain 😂 are you always gung ho for a slice, or are your friends sick of hitting the pizzeria with you for the third time this week? Desi Does Pizza Live - Tune In Tonight! I was on Canada's Newstalk 1010's The Night Side last night - if you missed it, listen below! Every party needs a great soundtrack, but a great pizza party requires a more specific set of tracks. Pizza rock is a small (but important) genre, and I highly recommend considering adding these jams to your next playlist! Pkew Pkew Pkew, "Let's Order a Pizza" - I've been obsessed with Pkew Pkew Pkew since I first heard them, and as a warning, this song will be stuck in your head for weeks. A great anthem for for those of us who suffer from hanger, this song encourages a pre-dinner pizza, of which I'm always a fan. Pizza Underground, "Cheese Days" - A 90's child star forming a tribute band about pizza? Sign. Me. Up. It's everything I love. My deepest Pizza Underground regret? Missing their show at Mercy Lounge when I lived in Nashville. There's nothing better than mowing down on a slice during a show! Teenage Mutant Ninja Turtles, "Pizza Power" - An anthem of my youth, to be honest. Their love of pizza is, I would safely guess, at least 89% of the Turtles huge (and enduring) success. Who didn't want to scarf down pizza with Michaelangelo? I still want to. Dean Martin, "That's Amore" - The track that truly expresses how I feel about pizza. Every love of my life will be compared to the feeling I get when I lay my eyes on that Spanky's buffet! And of course, the seminal classic, Gimme Pizza! What's on your perfect pizza playlist?